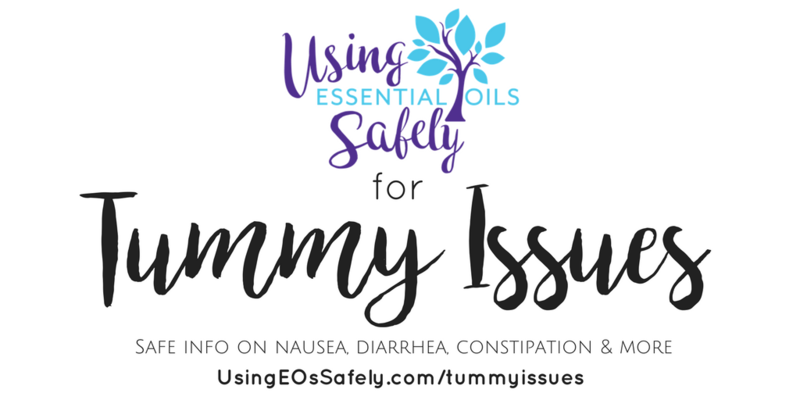 Using Essential Oils for Tummy Issues? The following info is a collection of tips and links which will be helpful for things such as nausea, diarrhea and constipation. Please note that essential oils are NOT always the go to for these types of things. * For small children, you want to look first to the non EO options. 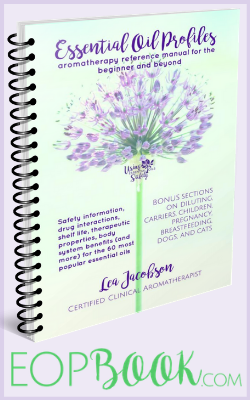 For more info on safely with children, please see the Essential OIls & Children page. * If it has been suggested to you that it would be safe to ingest certain oils to help with digestive issues, please reconsider and do some research first. We suggest that you should not ingest any essential oils at all unless you are under the care of a certified aromatherapist which has been thoroughly educated in the area of the internal use of essential oils. Please see our Ingesting info for more details. Consume probiotics such as water kefir & sauerkraut. Stay well hydrated and get plenty of sleep. Diffusing or properly diluting and rubbing on the tummy the following oils may help. These oils can also be used in a personal aromatherapy inhaler. * For indigestion you can also try consuming a spoonful or apple cider vinegar or papaya enzyme. * Drinking Chamomile tea can soothe the tummy. * The BRAT diet: is a bland-food diet that is often recommended for adults and children. BRAT stands for Bananas, Rice, Applesauce and Toast. The BRAT diet can help you recover from an upset stomach or diarrhea for the following reasons: It includes “binding” foods. Elderberry syrup is my #1 suggestion for viruses & colds, as it has been shown to reduce symptoms and length of illness. Elderberries are the best things to have around during cold and flu season. Taking a teaspoon a day can ward off illness, and a tablespoon a day can help your body bounce back from illness quicker. You can make your own very easily. Beyond boosting your immune system, elderberries are anti-inflammatory and have anti-cancer compounds. For those of you following ORAC ratings (ORAC stands for Oxygen Radical Absorbance Capacity) elderberries top the list with a rating of 147 (blueberries are only a 62!). Elderberries contain antioxidants, Vitamin C, Vitamin A, calcium, potassium, magnesium, iron, phosphorus, copper, B vitamins and more. Let it come back to a boil, then turn down and simmer until liquid is reduced by half. This takes about 25 minutes. Remove from heat. Using a mesh strainer, strain into a bowl. Using the back of a spoon, press down on the berries until you can squeeze out as much of the liquid as you can (transfer berries, et all, back to your saucepan for phase two). 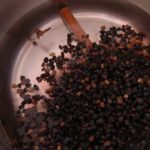 Add 2 TBSP honey to your elderberry decoction now, while the extract is still quite hot, stirring until it has melted into the extract. I poured my extract into a 1/2 liter Fido jar and moved it to the fridge. A mason jar is also a good choice. This elderberry syrup will keep for a couple of weeks before not being as potent, so there’s not need to make a large batch. Mine made about a cup total liquid. Back to the berries. Not one to waste, I boiled another 2 cups of water and went through the process again. This time, I let it boil a few minutes, then covered my saucepan with a lid and let it sit for a couple of hours. I did not add additional honey, but poured it in my 1/2 liter Fido along with the first batch.